The European Space Agency (ESA) spacecraft Rosetta – and her robotic lander companion Philae – have completed an amazing 10 year journey to arrive in orbit around Comet 67P/Churyumov–Gerasimenko. Rosetta is the first mission designed to orbit and land on a comet, with the potential to gain further understanding on how life started on Earth. The spacecraft was launched from Europe’s Spaceport in Kourou on March 2, 2004 on an Ariane 5G rocket. Her journey involved a distance of 800 million kilometres (500 million miles) from the Sun, making an orbit of Jupiter and also involved passing by Earth three times and Mars once, while also flying past two asteroids. Her arrival was confirmed on Wednesday morning, as the final burn took place, ahead of a 22 minute wait for the telemetry to travel through the vastness of space before arriving on Earth. Once confirmation was received, “We’re at the Comet” was called out on the live webcast. “After ten years, five months and four days travelling towards our destination, looping around the Sun five times and clocking up 6.4 billion kilometres, we are delighted to announce finally ‘we are here’,” said Jean-Jacques Dordain, ESA’s Director General. ESA created numerous animations and some brilliant cartoons to engage public interest in a mission that was spread over ten years. The mission consists of an orbiter, carrying 11 science experiments, and a lander, called ‘Philae’, carrying 10 additional instruments, for the most detailed study of a comet ever attempted. The mission had to be refined even before it had even launched, with a delay caused by the failure of the Ariane 5 ECA’s debut launch in December, 2002. 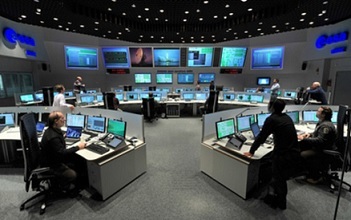 As a result, Rosetta switched targets, from an encounter with Comet 46P/Wirtanen – that had been planned for 2011 – to the 67P/Churyumov-Gerasimenko comet. Rosetta greeted two asteroids during the first part of its mission, the first in August 2008, when the spacecraft passed by (2867) Steins, a rare E-type asteroid. The second occurred two years later, this time with (21) Lutetia, a large asteroid, about 10 times bigger than Steins. I n January of this year a pre-set timer was tasked with waking up the spacecraft. Deep space tracking dishes were tasked with listening out for the signal confirming the spacecraft was awake and healthy, starting with NASA’s ‘big ears’ – the 70 m-diameter station at Goldstone, California, followed by, as the Earth rotates, the Canberra station in eastern Australia. Immediately after the spacecraft had been awoken, her startrackers began to warm up, before thrusters fired to stop the slow rotation. Rosetta made a turn directly towards Earth, before switching on her transmitter and pointing its high-gain antenna to send the signal to announce she was awake. The focus then switches to the rendezvous with the comet, achieving several space firsts. Rosetta is the first to orbit the comet and will be the first to land a probe on the nucleus – to a site in the southern hemisphere of comet 67P/Churyumov-Gerasimenko – making it one of the most complex and ambitious missions ever undertaken. The south also offers the most stable landing conditions, not least because Philae is powered by solar cells. The probe will experience higher levels of illumination as the comet approaches the Sun, aiding its health. Should Philae successfully land, it will obtain the first images ever taken on the surface of a comet and it will make the first in-situ analysis of the composition by drilling into the surface. 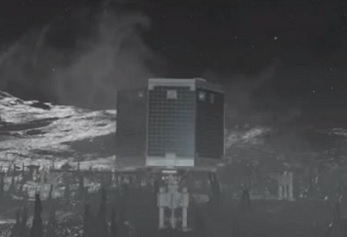 Philae will be only the second human-made object to land on a cosmic body far from Earth. It will follow the Huygens probe that landed on Saturn’s moon Titan, 1.3 billion kilometers from Earth, in January 2005. However, Rosetta will be the first spacecraft to witness, at close proximity, how a comet changes as it is subjected to the increasing intensity of the Sun’s radiation. 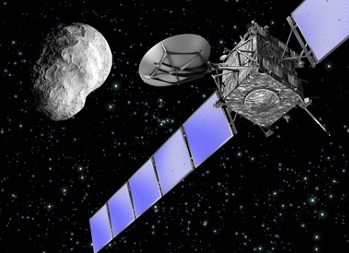 Upcoming for Rosetta will be for her to edge closer to the comit from the current 100 km distance. Over the next six weeks, she will describe two triangular-shaped trajectories in front of the comet, first at a distance of 100 km and then at 50 km. 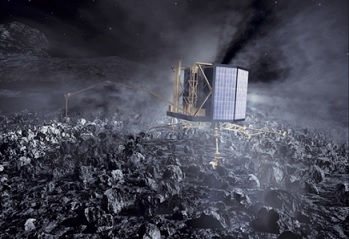 During this period, the spacecraft will provide a detailed scientific study of the comet, scrutinising the surface for a target site for the Philae lander. Eventually, Rosetta will attempt a close, near-circular orbit at 30 km – closer if controllers allow. “Arriving at the comet is really only just the beginning of an even bigger adventure, with greater challenges still to come as we learn how to operate in this unchartered environment, start to orbit and, eventually, land,” added Sylvain Lodiot, ESA’s Rosetta spacecraft operations manager. Once the landing site is confirmed, the final timeline for the sequence of events for deploying Philae – currently expected for 11 November – will be confirmed by the middle of October.